Cellulitis is another type of staph skin infections that diabetics and others are also at risk for. It is a bacterial type of skin infection, that can spread. This infection is actually in tissues beneath the skin. It starts out small, showing tenderness, redness, and also swelling is usually there. 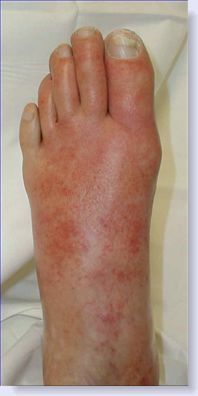 The red appearing area begins to get larger, and the onset of a fever begins as well. A person may also have chills and sweating. You will notice if you have this condition, that the lymph nodes will swell right around where skin is infected. Cellulitis is often mistaken for just something like impetigo, of which is only on the skin surface. This staph infection type is deeper than in the surface going down into the layers of the skin as does MRSA, which is another article on the site here. It is a staph infection just as MRSA is, and can be almost as serious. This skin infection is likely to come up on the legs or foot. It can also make an appearance on the neck, head, or arms. And it is not totally unheard of if it appears on the chest or abdominal areas. Wounds can bring on this staph-type infection, or it might happen following surgery. Symptoms You'll notice redness that appears on the skin, swelling around the areas, and pain wherever this infection is involved. If you have a redness which is of a scaly nature on the legs, this is not necessarily staph-infections but something called stasis dermatitis, which is unrelated to staph. Unlike MRSA, this type of skin infection is not contagious. Most doctors will treat this skin infection by first taking a culture for the bacteria and seeing if the level of bacteria is high which it usually is with this staph-infection type. If your doctor can't tell from the culture, then he or she may give antibiotics just for precaution. If the antibiotics do not do anything for this problem, then an autoimmune disorder may be responsible for the problem. In this case, steroids such as prednisone will treat it. To find out further information, see the short doctor's video below answering common questions about this skin infection. "All Natural Salves developed to help Diabetics heal"
Do you have a story you'd like to share about your diabetic skin problems? Skin problems can range from anything such as MRSA, Cellulitis, Necrobiosis Lipoidica, and many others.